Scooting to school is growing in popularity; for the children it’s a fun, fast way to get there. It’s also a great way to get children more active and is a great sustainable solution to coming to school by car. Why Encourage Scooting to School? Some of the benefits are shared with walking to school – fewer cars meaning less pollution and less traffic danger, exercise before school meaning children are alert, healthy and ready to learn. Scooting is an easy alternative to cycling. Learning to scoot safely will help develop the skills needed for future cycle training and means pupils can join in with some cycle events even if they can’t cycle, for example Sustrans’ Big Pedal event. Children who live further from school will enjoy the time-saving benefits of scooting and being able to ‘travel active’ rather than by car. Scooters can be stored fairly easily at school and don’t have to be a high cost item. Scooting is fairly inclusive; families who can’t afford a bike may be able to buy a scooter. Hold a ‘Scoot to School’ day or ‘Scooter Breakfast’ – those who scoot get an orange juice and toast for taking part… or another reward. Start a scooter club. Pupils may be more likely to scoot together if they know of others who scoot. It also makes them safer if they are in a group. Give out bright stickers to recognising those who took part. They can use them to decorate their scooters. Bring it into the classroom… not the scooters! I mean the subject of scooting. Why Animals Can’t Ride Scooters and You Can’ is a great book for this.Shout about it! If you are having a scooter event, get pupils to write press releases and design posters to promote it. Tweet about your activities – mention @brightkidz so we can re-tweet. Embed it in your school culture. Publish a policy about scooting on your school website, in your prospectus and mention it to new parents at the school. Include it in your school travel plan, in your Eco Schools diary. By doing any or all of this you could also be fulfilling one or more initiatives for the Modeshift STARS School Travel Awards Scheme (in which many schools in England take part) or a recognition initiative in your area. Grown ups can scoot too! See the Scooter Smart Grown Ups Gliding initiative. 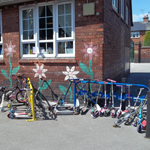 Full scooter racks are evidence of active pupils and promote an active travel culture. Ask us about our forthcoming scooter storage solutions.